On Aug. 23 and 24, 2014, Los Angeles’ largest music festival opened its doors for an eleventh consecutive year. Boasting a lineup that included decade-old, post-punk revival bands such as The Strokes and Interpol alongside fledgling electronic acts such as Les Sins and Kelela, FYF Fest offered ticketholders a diverse range of artists and genres, guaranteeing that at least one act on the bill would match any individual’s palette. However, FYF’s auspicious lineup would find itself marred by a lack of organization among the event’s staff that led to several glaring issues in the festival’s first day. Many who arrived early on Saturday reported waiting up to two hours in the security check prior to entering the festival. This delay caused many attendees to miss the day’s earlier sets, casting a somber cloud over those who had hoped to take in Connan Mockasin’s sultry psych pop or hear a bit of Angel Olsen’s powerful voice. Furthermore, the amount of food vendors within the venue was unable to support the sheer number of people at the festival; therefore long lines were formed in front of nearly every food truck, with a similar situation occurring in the festival’s craft beer gardens. Yet, the most significant criticism of the day involved the chaos regarding The Arena (an indoor stage which hit its capacity after only two of its seven scheduled performances). The Arena– with the juxtaposition of its dark aesthetic alongside the several bright disco balls and intricate stage lighting found in this venue within-a-venue, quickly became a crowd favorite. This atmosphere, coupled with incredible acoustics and an impeccable lineup on both days, ensured that the stage would be packed throughout the weekend. However, on Saturday the entrance to the stage’s floor was barred off shortly before Chet Faker’s set due to issues with the venue’s capacity. The floor remained closed through Todd Terje’s upbeat set of disco-influenced productions until a lucky few were allowed to enter the floor in time to catch an astounding set from Caribou. 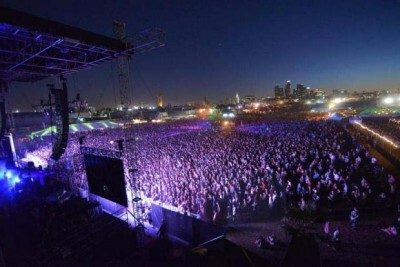 Although these issues may have sullied a day worth of amazing performances, FYF is no stranger to facing problems after switching venues: the 2009 and 2010 editions of the festival drew much criticism for many of the same issues (excluding, of course, the capacity limit of The Arena) after FYF had switched locations from the Echo and Echoplex to the Los Angeles State Historic Park. On Sunday, the lines moved much quicker. Additionally, they addressed the issue of The Arena’s limited capacity by permitting entrance to the balcony area, allowing a significantly greater amount of people into the stage. Overall, despite the troubles of the first day, this year’s FYF Fest was successful for the same reason that it is successful every year – an impeccable assortment of artists to choose from. Each of Dan Snaith’s appearances – the first as Caribou, the second as Daphni – were impressive in their own right. The nostalgia was abundant as many flocked to catch hit-filled sets by Interpol and The Strokes. Up-and-coming acts such as Les Sins, Twin Peaks, Benjamin Booker, and Kelela all established their individual worth among the larger names on the festival’s bill. Acclaimed, yet contemporary artists such as Flying Lotus and Grimes, moved their respective audiences in a way that only a performer at the height of their career would be able to. Although they will have to address some issues before returning to their new home, as long as the FYF staff continues to book such exciting artists the future of the festival will continue to look promising. FYF Fest has proven yet again that musical quality reigns supreme in the festival experience.